Betsy Woodruff has a story reminding us that Trump has a joint defense agreement with some of the other people caught up in Mueller’s probe. The president’s personal lawyers have teamed up with attorneys for other individuals embroiled in special counsel Bob Mueller’s probe, multiple sources tell The Daily Beast. For a while, the president’s lawyers even had regular conference calls with other attorneys to discuss the Mueller investigation, according to one source familiar with the calls. The arrangement is known as a joint defense agreement, and it allows the lawyers to share information—without violating attorney-client privilege. It’s a common strategy when multiple defendants are dealing with the same prosecutor on the same matter. I say “reminding us,” because this is not news. When Mike Flynn flipped, the first notice came when he alerted this very same joint defense agreement he could no longer share information (as the story itself notes). The story doesn’t even describe, generally, who is included in it, which might help observers understand the dynamics we’re watching. The closest hint of that is the observation that Paul Manafort might be going to jail on Friday. This week is poised to be less-than-harmonious for at least one person in Mueller’s sights: Paul Manafort, who will appear in court on Friday for a hearing where a judge will decide whether or not to revoke his bail. The article doesn’t even confirm that Manafort is part of the defense agreement. But Trump was bragging, back in January, that he had “decided that a key witness in the Russia probe, Paul Manafort, isn’t going to ‘flip’ and sell him out, friends and aides say.” That’s the kind of thing Trump might have assurance about if Manafort were part of a joint defense agreement, particularly if — as has subsequently been reported — John Dowd offered Manafort a pardon (through one of his lawyers, in the kind of discussion lawyers might assume were shielded by a joint defense agreement) last year. The pardon discussion with Mr. Manafort’s attorney, Reginald J. Brown, came before his client was indicted in October on charges of money laundering and other financial crimes. Mr. Manafort, the former chairman of Mr. Trump’s presidential campaign, has pleaded not guilty and has told others he is not interested in a pardon because he believes he has done nothing wrong and the government overstepped its authority. Mr. Brown is no longer his lawyer. Mind you, now we know that Mueller knows about such offers (because it’s one of the questions they posed to Trump in March). That makes Trump’s legal impunity for offering such pardons at least slightly more sketchy, particularly if he’s pardoning someone so obviously corrupt as Paul Manafort. Add in the fact that Jared Kushner sold out Flynn last fall (which is reportedly what led him to flip), and Manafort may be less certain about Trump’s reliability, even in spite of Trump’s Tweets suggesting FBI should have prevented him from hiring someone they were investigating back in 2016, posted — with remarkable prescience! — on the eve of the latest setback in Manafort’s case. Still, the reminder that Trump and a number of subjects of this investigation have been comparing notes explains a lot we’ve seen since. It explains, for example, why Manafort has made such a diligent effort to get the court to disclose information to him– such as the substance of warrant affidavits to seize up to four other people’s AT&T phone information, or the other bullet points in Rod Rosenstein’s August 2, 2017 memo laying out the scope (at that point) of the investigation — that affects others likely covered by the defense agreement. It explains one advantage to Manafort of insisting on being charged in two jurisdictions: because it gives him two bites at an attempt to challenge Mueller’s jurisdiction. The joint defense agreement also explains several other things we’ve seen, such as the coordinated messaging — particularly the planted narrative about Spygate — best explained by the coordination of Victoria Toensing armed with information only legally available to Trump. Finally, it explains the delay in any charges related to the conspiracy between Trump and the Russians: once Mueller charges those issues, he will have to provide discovery about what he knows, which will then get shared back with others involved in the conspiracy. It appears he’s primarily sharing that information (aside from in the form of questions to witnesses who appear before the grand jury) with those who’ve flipped. Even the questions he has posed to Trump are probably sharply limited to hide the main thrust of the conspiracy investigation. That’s why the stakes for Friday are so high (and the timing of this reminder that there’s a joint defense agreement). Mueller still won’t need to provide Manafort the evidence he has about his role in the conspiracy, though the indictment of Kilimnik gets far closer to that. But it raises the cost on Manafort for sustaining a joint defense, minimizes his value to the others, all while the crimes charged could still be refiled in a VA state court. This may be a very stupid question, but is it legal for one lawyer to offer another lawyer of a different defendant a pardon in exchange for not talking? Is that part of shared attorney/client privilege? It doesn’t sound like it to me. Marcy, how do you think Mueller knows that this offer was on the table? Through someone telling him or other means? If a lawyer is actively attempting to obstruct justice via the dangle of a pardon, does that mean that lawyer can then be questioned by Mueller? Does Mueller know about the dangle to Manafort because Gates’ then-lawyer was present at the meeting where the dangle occurred? If so, could Gates’s lawyer share that information with Mueller (with Gates’s consent) without violating attorney-client privilege? Lawyers engaged in providing legal advice to a client are communicating on behalf of that client, not themselves. The privilege is the client’s. It can be waived by the client. It can also be lost. An example would be allowing others beside the client, and the lawyer and those working for or under her direction, to hear otherwise privileged communication. Ordinarily, communications between lawyers part of a mutual defense agreement would remain privileged. Negating the privilege would require finding some exception, such as the crime fraud exception. Where the lawyer’s conduct is aiding the commission of a crime, the lawyer is not providing protected legal advice, which would justify the privilege, but acting jointly with someone else to perpetrate a crime. That is not privileged conduct. If the pardon dangle is obstruction, it would fit the crime fraud exception and the communications between the lawyers would not be privileged. Bmaz would have to comment on what’s required for that. With that in mind, I would expect some more indictments from Mueller in short order, since he has been ordered to identify the Russian foreign agents. That’s one way to release the list, but it also seems to me that Manafort’s team is trying to limit the scope of the prosecution. I know it irritates the lawyers here, but when does it become time to throw in the towel? Does this “joint defense” agreement (I will assume Manafort has one) mean that Manafort has more to fight with than we thought? Not a lawyer, but what do you mean by “throw in the towel”? That usually signals defeat. 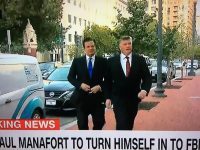 Are you saying Mueller doesn’t have enough on Manafort? By Manafort’s team, not Mueller’s. See Earl’s response below for when we will know they do give in. However, wasn’t Manafort already under a sweet plea deal that included cooperation which to me (IANAL) would mean that a JDA is not possible? Plea deal for Flynn, not Manafort. A joint defense arrangement is a tag team defense against a single prosecutor opponent. It allows cooperating defendants to mount common defenses, to seek to disclose common facts and common characterizations of them, to work toward not disclosing other facts – short of perjury or obstruction. It allows defendants multiple bites at the prosecutor, seeking to disclose more of her case in chief and her knowledge of facts underlying it. That allows each defendant to prepare a better defense by honing in on weaknesses. Importantly, the arrangement signals to each remaining member that a party to the deal has flipped, because they have to withdraw from the joint defense when doing so. Those on Manafort’s team with experience in organized crime cases, for example, would find this a familiar defense tactic. They will have planned and prepared for it, both regarding defendants party to such an agreement and for their overall strategy. Not to worry. The order is minimal. It requires Mueller to ID people the press has already IDed. Question with regard to the statement, “the crimes charged could still be refiled in a VA state court.” Is it within Mueller’s authority to prosecute a violation of state law in state court, or would he have to hand it off to the state AG? In light of the parallel national security investigation, I don’t think anyone should read too much into the fact that Mueller has indicted Manafort for seemingly tangential crimes. Mueller won’t burn a source/method unless it’s the only option to bust someone big (and even then maybe not), and with Manafort there are plenty of other ways for Mueller to send him to jail for the rest of his life. It gets more interesting with Kushner, though, because he was allegedly in charge of the digital operation, which would put him at the nexus of a lot of shadiness – but with family ties that make him harder to flip and murkier potential financial transgressions to use as leverage for a plea. I’m a little surprised that Wilbur Ross hasn’t found his way into this mess, considering his deep involvement with that Cypriot money laundering bank. There’s still time, I suppose, and Mnuchin’s film company had a bunch of Russian ties, too. What does Watergate, The Russian investigation and James Joyce have in common? No. It refers to Kushner disavowing ordering Flynn to do what he did.